Pour distilled water or pure rose water into the small mixing bowl. Pour pure natural vitamin C powder (L-ascorbic acid) into it. Let it dissolve completely in the water. You may also stir with a spoon for expediting the procedure. Once the liquid mixture is ready, pour it into the dropper bottle carefully. In case you are using chewable vitamin C tablets, just drop them into the glass dropper bottle and pour distilled water or rose water over them. Close the lid of the bottle and shake well so that the tablets get dissolved completely. Pour vegetable glycerin into the bottle. Pierce the vitamin e gel capsule and add its content to the mixture of the bottle. Close the lid of the bottle and shake vigorously to mix everything together so that a uniform liquid serum is prepared. Store the glass dropper bottle in a cool dark place, preferable inside the refrigerator. If you’ve made it without vegetable glycerin, it will stay up to 2 weeks in the fridge. However, the homemade vitamin C serum with vegetable glycerin will last a month or even longer. 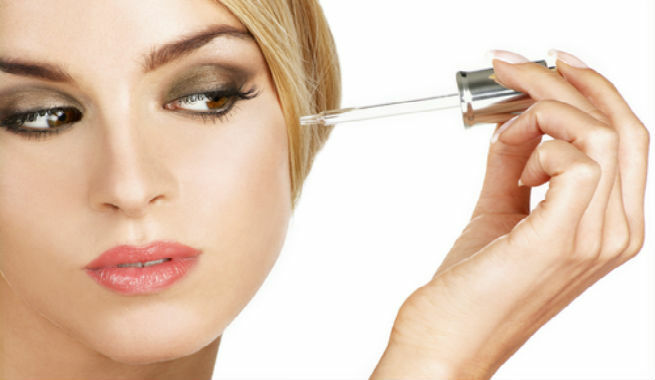 The application procedure of vitamin C serum should be strictly followed as it might damage your skin otherwise. To start with, cleanse your face with a mild cleanser thoroughly and pat it dry. Apply a natural toner to shrink the pores. Now, take the serum in a very small quantity, preferably 2 drops, and apply all over your face after rubbing it in between your palms. Apply your regular moisturizer to your face over the serum and you are done. Make sure that you practice this at night before going to bed and leave the serum on your face overnight. This will ensure the best possible results over time. If you have a sensitive skin, take a little less amount of vitamin C powder or tablet to avoid irritation or tingling sensation. You should also apply the serum only on alternate nights for the first 15 days and allow your skin to adapt to it gradually. The measurement of vitamin C powder / tablet should be done carefully. Topical application of too much vitamin C can burn the skin. Day application of vitamin C serum is not at all recommended as the vitamin increase the sensitivity of our skin to the sun to a great extent. However if you are still want to give it a try, make sure that you apply a high-SPF sunscreen after the moisturizing part. 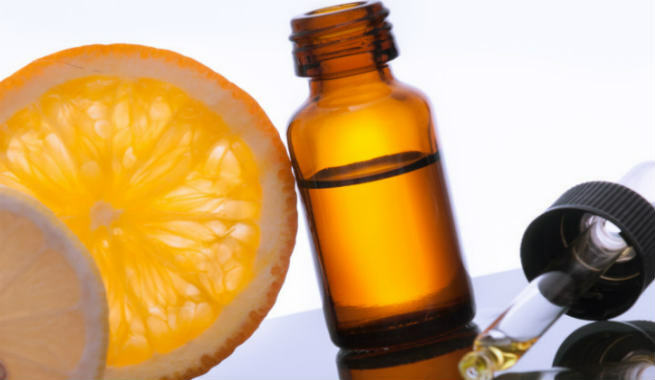 Homemade vitamin C serum can do wonder for super dry or visibly aging skin. But you must not add the vitamin in extra quantities in anticipation of faster outcomes. Rather, work up slowly and do a patch test before each experiment. Vitamin C oxidizes very easily. Hence, always keep your homemade vitamin C serum in a dark-colored bottled or container. If, by any chance, your serum gets oxidized and turns discolored, discard it immediately. Prepare your vitamin C serum in small batch and make it a point to use it within a week to reap the maximum benefits. 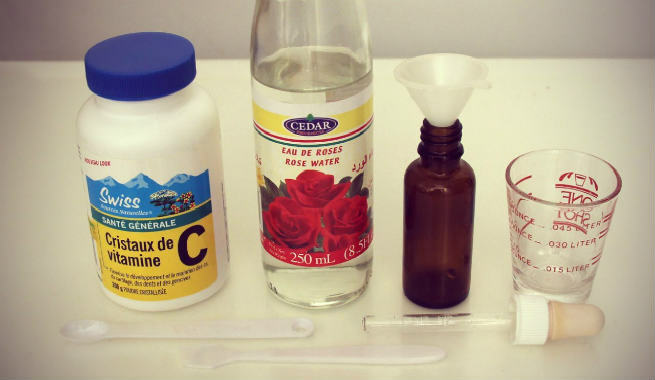 Both distilled water and rose water can dissolve vitamin C powder. However, using rose water instead of plain distilled water will make your serum slightly scented. Dry-skinned beauties might find adding a bit more glycerin to the serum helpful. It will hydrate the skin from inside and keep it moisturized for the whole day. Vitamin E gel or oil is not necessary for this recipe. However, it will increase the stability of the serum and as a bonus, you will be able to enjoy the awesome anti-aging benefits of vitamin E.
Regular use of vitamin C serum can give you smaller pores, clean and clear skin (reduced marks of acne and blemishes), healthy and radiant skin with less visible signs of aging, and so on.